Make this delicious Instant Pot Portuguese Chicken and Rice Recipe (Pressure Cooker Portuguese Chicken and Rice) Galinha à portuguesa 焗葡國雞飯! Imagine a spoonful of tender chicken & veggies, soaked in aromatic coconut turmeric sauce, paired with perfectly cooked fried rice, topped with creamy melted cheese. Comforting Macanese dish that you’ll gobble one bite after another! If you’re Portuguese and are scratching your head wondering why you have never heard of this dish, I won’t blame you! This Baked Portuguese Chicken and Rice dish (Galinha à portuguesa 焗葡國雞飯) did not come from Portugal, but Portuguese Macau (Macao). 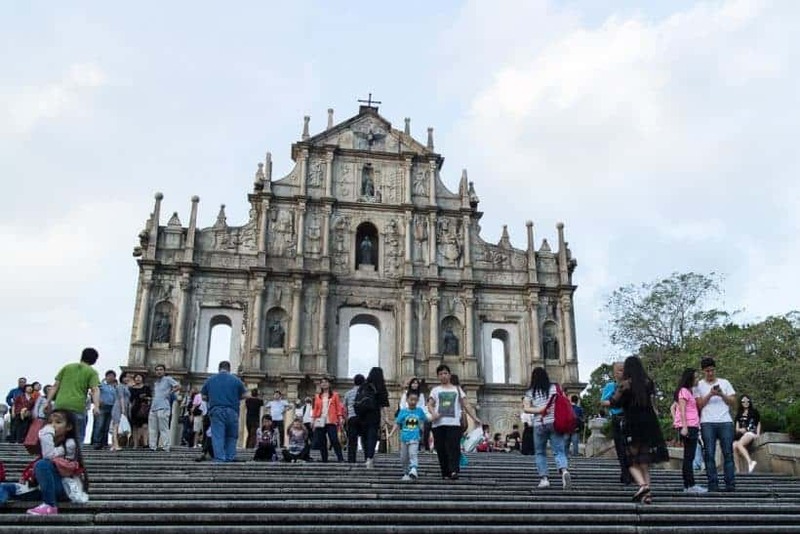 Macau was once administered by the Portuguese Empire from mid-16th century to 1999, being the last European colony in Asia! At the time, Portuguese traders and sailors attempted to replicate dishes back home with aromatic spices and flavors they can get their hands on. This was how many unique Macanese dishes were born blending Cantonese and Portuguese cuisines, along with some Indian, African, and Southeast Asian influences. One of the most iconic sights – Ruins of St. Paul’s, originally built in 1602. 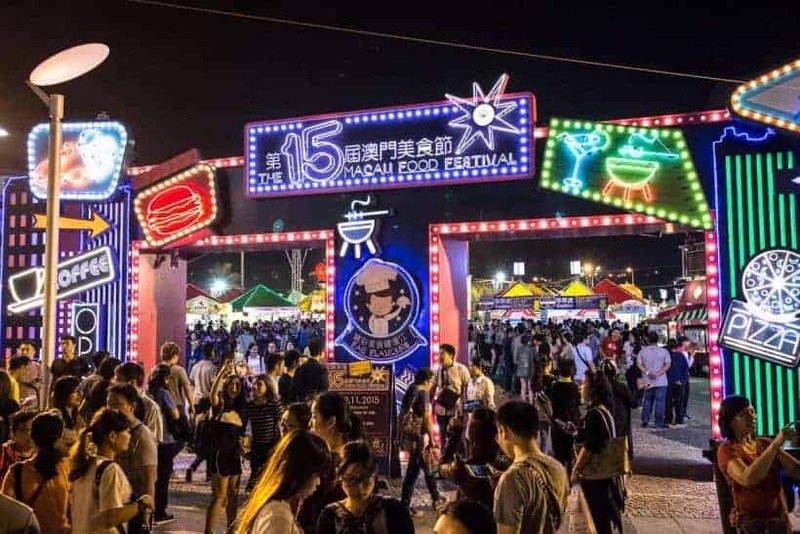 As avid foodies, their annual extravagant food festival was a must. Readers have been loving our Cha Chaan Teng Series – such as our Instant Pot Pork Chops in HK Onion Sauce Recipe. We’re excited to share this third Cha Chaan Teng 港式茶餐廳 (Hong Kong style cafes) classic favorites – Baked Portuguese Chicken and Rice 焗葡國雞飯 with you. This Portuguese Chicken and Rice dish is not spicy with strong aromas from the turmeric and coconut milk. You’ll love this flavorful yet mild & creamy sauce! 100% unsweetened coconut milk – this is the best tasting one out of the 4 we tried in creating this recipe. It’s not diluted, no additives, stabilizers, thickeners, gums, or preservatives. Optional: Multi-Ply Clad Stainless-Steel 13-Inch Wok – This high quality 18/10 stainless steel wok heats up evenly and quickly. Perfect for stir-frying. Definitely a keeper! High quality coconut milk will really make this dish shine. We tested this recipe with 4 different brands of coconut milk and found it makes a big difference in flavorful and taste of the final dish! This 100% Pure coconut milk is creamy and is the best out of the 4 we tried. In fact, the best we have used so far! We tested the optional oven step using 2 different types of oven-safe containers and had different final results. So, find containers that will suit your preference! 3. Do you need to use overnight leftover rice to make fried rice? It’s a very common practice for Chinese to use overnight leftover rice to make fried rice in order to achieve the dry and perfect texture. However, if you’re able to cook rice with the right dry texture, there’s no need to use leftover rice. So, be sure to use the exact measurements for cooking the rice, or else the fried rice will turn out wet and mushy. 4. Can I use other chicken parts other than chicken quarters? Yes! If you don’t want to debone the chicken raw, you can use 5 bone-in chicken thighs (6 minutes + Natural Release) or 6 bone-in chicken legs (8 minutes + Natural Release) for this recipe. Or, you can easily remove the bones and cut them into pieces after they have fully cooked in the pressure cooker. This way, the sauce will be even more flavorful! Now it’s YOUR turn to take out your pressure cooker and make some Instant Pot Portuguese Chicken and Rice! Make this Instant Pot Portuguese Chicken and Rice Recipe (Galinha à portuguesa 焗葡國雞飯)! Tender chicken in aromatic coconut turmeric sauce, paired with perfectly cooked fried rice, topped with creamy melted cheese. Marinate the Chicken Thighs: Marinate chicken with ½ teaspoon of sugar, a dash of ground white pepper, 1 tablespoon of light soy sauce, and 1 tablespoon of Shaoxing wine for 20 minutes. Prepare the Pressure Cooker: Heat up pressure cooker (Instant Pot: press Sauté button and click adjust button to go to Sauté More function). Make sure the pot is as hot as it can be when you place the onions in (Instant Pot: wait until indicator says HOT). Sauté the Onion, Shallot, and Garlic: Add 1 tablespoon of peanut oil into the pressure cooker. Add sliced onion & shallot, sauté until brown & fragrant. Add minced garlic, sauté until fragrant. Season layering with kosher salt & ground black pepper if desired. Sauté the Chicken Thighs: Pour in the chicken, sauté until slightly browned (let the chicken caramelize on one side first before stirring, you don’t have to stir continuously). Add in 1 ½ teaspoon of turmeric powder & 1 teaspoon cumin powder. Sauté & mix well to let the spices release their aroma. Add quartered potatoes, carrots, & 2 small bay leaves. Mix well. Deglaze: Pour in 200 ml of coconut milk & 1 tablespoon of light soy sauce, completely deglaze the bottom of the pot with a wooden spoon. Pressure Cook the Portuguese Chicken and Rice: Place a steamer rack into the pressure cooker and carefully place a bowl with (250g OR 1 cup + 1 ½ tablespoon) of Jasmine rice onto the rack. Pour (230 ml OR 1 cup minus 1 ½ tablespoon) of water into the bowl of rice. Make sure all the rice are soaked with water. Immediately close lid and cook at High Pressure for 4 minutes. Turn off the heat and Full Natural Release. Manually release the remaining pressure by carefully turning the venting knob to the venting position. Open lid carefully. Optional Flavor Enhancing Step - Preheat Oven: While the Portuguese chicken and rice is cooking in the pressure cooker, preheat oven to 425°F. Thicken the Coconut Sauce: Fluff rice and set aside to allow it to cool down. If you are making the optional fried rice, preheat a wok or skillet on high heat with 2 tablespoons of peanut oil. Turn heat to medium (Instant Pot: Press sauté button). Add green pepper, cook for one minute, taste the seasoning. Add more light soy sauce, coconut milk, or salt if desired. Mix the cornstarch with water and mix it into the coconut sauce one third at a time until desired thickness. Turn off the heat. Optional Flavor Enhancing Steps - Fried Rice: When the oil starts to smoke, add in the fluffed rice and press them against the wok with a wok chuan (wok spatula) to separate the rice from each other. Repeat for roughly 20 - 30 seconds. Add 1 beaten extra-large egg on top of the rice and quickly stir-fry the rice to allow the beaten egg to coat the rice evenly. Stir-fry for another minute until fragrant, then season with sea salt. Mix well and turn off the heat. Optional Oven Step: Fill an oven-safe container half-way full with fried rice. Fill up the container with Portuguese chicken and vegetables. Add grated cheese (as much as you like!) over the top and place into oven for 5 – 10 minutes. 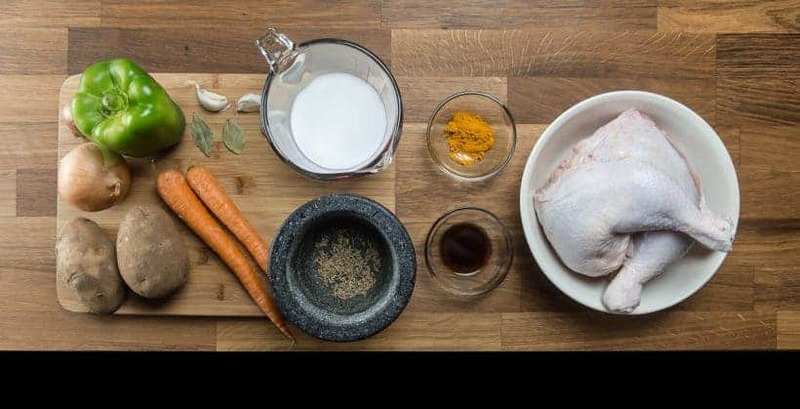 Chicken: If you don’t want to debone the chicken raw, you can use 5 bone-in chicken thighs (6 minutes + Natural Release) or 6 bone-in chicken legs (8 minutes + Natural Release) for this recipe. If you wish, you can easily remove the bones and cut them into pieces after they have fully cooked in the pressure cooker. I am sure the sauce will come out more flavorful with the attached bones! Coconut Milk: High quality coconut milk will really make this dish shines! Be sure to use one that's great quality. My hubby is allergy to dairy and also shouldn’t be consuming coconut milk. is it possible to replace the coconut milk with rice milk and still somehow add in a thickener? Thank you for your question. Rice milk should work just fine! Thank you for this delicious recipe! How would the cooking time change if I used FROZEN chicken thigh without bones? If you are cutting them up, it will still take the same time. I will just add an extra minutes just to be safe. What would timing be for boneless chicken breasts? If you are cooking it as a whole, it will be 5 minutes at high pressure and 10 minutes natural release. I would say roughly 5 – 6 pieces of boneless skinless chicken thighs. This was another amazing recipe!!! I did it with boneless skinless chicken thighs for 6 minutes and it was great! My husband loved how perfect the rice was, and I even took leftovers to my coworkers and they all raved! I know I keep repeating myself, but thank you so much for the support and kind words. I finally have an Instant Pot! This is my first venture into pressure cooking. My mom used to make Portuguese chicken for us and I’m eager to try your recipe. If I use chicken drumsticks, would it still be 5-6 mins + natural release? Or are thighs a much better option? Drumsticks will work. They will take 7 minutes and natural release. 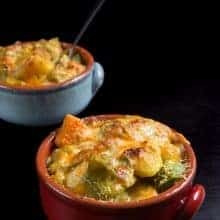 Hi is it possible to substitute the coconut milk for something else? Thanks! No substitution I can think of as coconut milk is quite essential for this particular dish. Made this tonight using bone in chicken thighs and it was simply amazing! My husband kept commenting on how delicious it was. In fact, it smelled so delicious when I took the lid off, I completely forgot to add the peppers at the end! We were so hungry it I just dumped in the cornstarch water and hollered for my husband to come dish up! Thanks for the great recipe and the interesting history of the dish. Happy to hear from you again and thank you so much for your kind words! Say thank you to your husband for his kind words for us!! Hi Amy and Jacky: I received an Instant Pot for Christmas and am SO excited to use it! 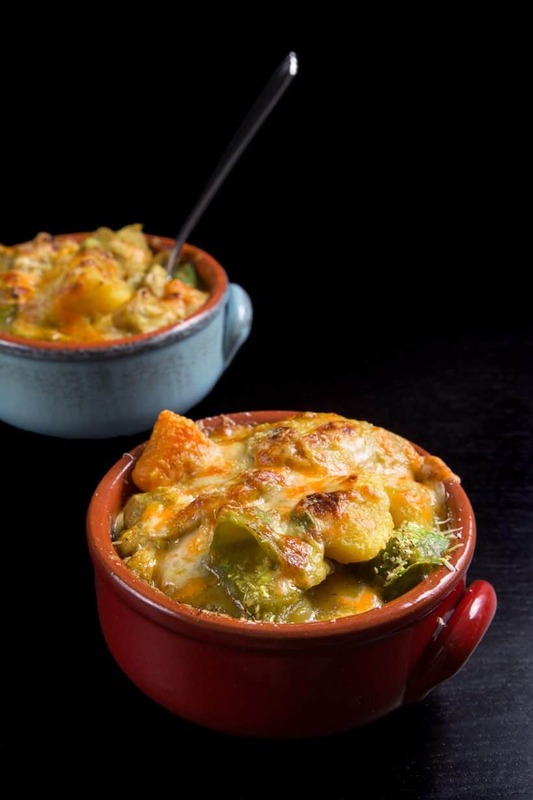 I was delighted to come across your website with it’s delicious recipes!! Thank you for taking the time to test them all and for answering our newbie questions!! Scrolling through your online Q&A has been very helpful to me! I look forward to trying MANY of your recipes!! What a delicious sounding recipe. I’m planning to make it for 30 people, using 40 chicken thighs so about 8 times the recipe. We have 3 large instant pots, we will make it in batches then put it all in the oven together. I will make rice on the side, because my group prefers brown rice. I will reduce the coconut milk proportion as you suggested in comments above. Will I need to reduce some of the spices/flavorings too? What do you recommend for a side dish to this? Our crowd loves green salads and vegetables but I would love to stay in the Macanese theme. The spices and flavoring should be fine without any adjustment. It will depend on how much chicken is being cook per batch, so please do taste and adjust accordingly. Too much chicken, the juice releases from the chicken will dilute the seasoning. So happy that I found your site and you sharing all the Asian recipes for IP! Thank you! Quick question.. I need to cook for 4 and can cook my rice in my rice cooker. How do you double the recipe and can chicken breast be used? You can just double the meat portion and vegetable portions. Since there will be more meat juice being released, you will want to taste and adjust the seasoning at the end. Chicken breast can be used, but it will be drier. The cooking time will be 5 minutes and then natural release for 10 minutes for whole chicken breasts. I am hosting my dad’s birthday and would love to make this recipe since he is from Macau. So glad I found this recipe. I have an 8 quart pot, and plan to cook 15-16 chicken drumsticks raw. What is the pressure time you suggest? Would you suggest quadrupling your ingredient amounts? Thanks. For this recipe, I would only increase the coconut milk to 250ml as the chicken drumsticks will release a lot of moisture. I would increase the spice and seasonings by 25%. For whole drumstick, the cooking time will be 8 minutes + Natural release. I love your recipes! I’m planning to make this dish this weekend and wanted to ask if I can just make this dish without making the rice with it? I plan to make the rice separately in a rice cooker. Do I need to make any adjustments to the cooking time? I’m planning to use 8-10 skinless chicken thighs. The cooking time will not need any adjustment. Take care & have fun cooking it this weekend! Hi, I am thinking about making this soon and I was wondering if a circular springform pan will work for the PIP rice. I know the pan is IP safe and fits well. Also wondering if there is a substitute for peanut oil? Thank you so much, I look forward to trying this because I love Portuguese chicken and rice! It’s great to hear from you again Holly! I would say about 8 – 10 chicken thighs. If you are cooking them whole (recommended to not overcook), it will take 5 – 6 minutes + natural release. Any change in the timing if I use boneless chicken thighs? If you are using whole boneless chicken thighs, it will take 5 – 6 minutes + natural release! Is there anything that I can substitute for the shaoxing wine? I have to be gluten free and any kind of wine gives me migraines. As a time saver, I used 8 boneless skinless thighs. I also used a full can (400 MLS) of coconut milk. Everyone really loved it. Thanks! Will make again. Hi! I was wondering if I could use the pot from a small rice cooker as the PIP bowl? It feels like it is made of aluminum? With a non stick inside? Thanks! The aluminum bowl should work. Be careful not to scratch the non-stick coating! If it is too thick, the rice may come out undercooked. Give it a try and let us know the result! I just realized that there are some scratches in the non-stick 🙁 probably shouldn’t use it then? What about using a pyrex? Pyrex bowl is thick and will require a longer cooking time for the rice. Best to use a thin stainless steel bowl or corelle bowl for pot in pot! I did my rice first in the inner pot as my chicken was marinading. Then after the chicken was done I just poured the rice into the rest so it was almost like a stew. I did use the whole can of coconut milk just for our preference. Love love love the idea of cooking rice and chicken at the same time! How big is this IP? And the size of the inner pot for rice cooking. How long does it take to NPR this dish? Do you think i can sub the white rice for brown rice? Brown rice takes 15 – 20 minutes to fully cook. I’m from Hong Kong and LOVE Portugese chicken. I’m really excited to try cooking it at home. Thanks for sharing your recipe! Do you cook the chicken all the way on the saute setting before pressure cooking, or just sear it, or something in between? Making this for the second time, it’s an awesome recipe! I love that it puts together flavours I wouldn’t have thought of – thanks for the recipe and the history lesson! Looks fantastic and I love your videos. Would that change the cooking times? No cooking time has to be changed. This Portuguese chicken looks so good. Now I am tempted to make this one for my blog. Awesome recipe! Pressure cookers are indispensable in our household! Wow, this was so interesting! I didn’t know anything about Macau and loved the history lesson…and all the food talk! Sounds delicious! I love that you plan your “must eats” when you travel! I do the same thing! Beautiful pictures of the scenery too!! I’ll have to try this recipe!